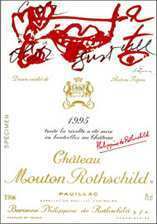 This bottle of Mouton ’95 was surprisingly disjointed on the nose and seemed to be cowering next to the ’96. The herbaceous element was more pronounced than anticipated, some lovely hot gravel and stony scents but missing the breeding of the following vintage. The palate is better with blackcurrant, cedar, graphite and slightly coarse tannins. This is like a car that cannot get out of second gear and yet, it seems like a very nice automobile. I would like to taste this again but on this showing, go ’96. Tasted February 2011.